Laos has been known since ancient times as Lan Xang, or Land of the Million Elephants, and offers visitors a glimpse of old Indochina. It is less developed than its neighbours China, Thailand and Vietnam, and traditionally the most reserved, but offers natural beauty and shy hospitality combined with a mix of original Buddhist culture and French influences. It also shares its borders with Myanmar (Burma) and Cambodia. A mountainous, landlocked country, situated at the heart of South East Asia, Laos's lifeline is the Mekong River, which flows the length of the country, providing water for agricultural lands and a major means of transportation. Vientiane, the unassuming capital, is situated on its banks, and the city provides a comfortable introduction to the charms of the country. However, most tourists to Laos will find its most enticing destination is the city of Luang Prabang, the former royal kingdom, with a legacy of splendid golden temples and whitewashed houses. While it might be true that sights and attractions in Laos are few, they are nonetheless extremely special. A troubled history of French colonisation, internal conflicts and assertive communism chased much of Laos's population away in the 1970s, and isolated the country from the outside world. Today though, the doors stand open, and services for travellers are gradually being instituted so that visitors can enjoy an unrivalled look at the old-fashioned way of life predominating in a country still largely unscathed by the harsh effects of mass tourism. Tourists willing to brave the lack of infrastructure will discover charming towns and rural villages, smiling, endearing people, splendid scenery, and a slow, relaxed pace of life. Most foreign passengers to Laos can obtain a visa on arrival, provided that: (i) they are arriving at one of the following airports: Vientiane International, Luang Prabang, Pakse, Warray; (ii) they are holding a return/onward ticket and the necessary travel documentation for their next destination; (iii) they have a confirmed hotel reservation in Laos; and (iv) they are in possession of one photograph, size 3 x 4 cm (however, it is always recommened to travel with more than one) (v) their passport contains at least two unused visa pages. These tourist visas are valid for 30 days. Note that a yellow fever vaccination certificate is required to enter Laos, if arriving within six days of leaving or transiting through an infected area. NOTE: It is highly recommended that your passport has at least six months validity remaining after your intended date of departure from your travel destination. Immigration officials often apply different rules to those stated by travel agents and official sources. The Royal Stupa is a symbol of Buddhism and Lao rule, and is Laos' most important religious building. A wonderful sight for tourists in Vientiane to behold, the dazzling golden temple and its spire are visible from afar. 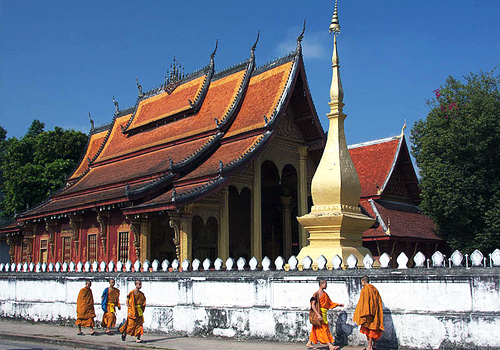 Locals claim that if you have not visited That Luang, you have not visited Laos. The base of the stupa has walkways and stairs connecting the different levels, designed for the faithful to climb. Each level has different architectural features pertaining to Buddhist doctrine. Worshippers stick balls of sticky rice to the walls as a mark of respect to the spirit of King Setthathirat, who built the shrine in 1566 and whose statue stands in front of the temple. The effects of the setting sun on its golden surface are stunning. There is a lot to see in the area and it is best to have a local guide to explain the significance of the site. Paying entrance only allows access to the base around the stupa. The view from the other side of the walls, however, is just as good and many prefer not to pay. The three temples that surround it are free and the golden, reclining Buddha statue does not require an entrance fee, either. It is best to get to the site early, before the tour buses arrive. The site known as Buddha Park is a bizarre collection of Buddhist and Hindu statues scattered around a riverside meadow, dominated by a gigantic reclining Buddha. Hundreds of huge concrete structures that combine Buddhist and Hindu philosophies are spread around representing a variety of deity forms. Fashioned by a purported holy man, the sculpture park was created to spread his beliefs and to reveal to mankind his ideas about the universe. This odd attraction is popular and has many unexpected treasures. There is amazing detail on many of the statues, which are not the run-of-the-mill kind seen all over Laos but in many cases are quite unique. There is fun to be had climbing and exploring: don't miss the giant pumpkin-like statue which one enters through the gaping mouth and ascends via steep internal steps to reach a viewing platform and a beautiful Tree of Life sculpture on the top. The park is a pretty area and visitors are free to touch, take photos and explore without much restriction which is refreshing. There is a restaurant at the park which serves decent food. Getting there takes a while but the rural scenery that is passed along the way makes the journey interesting in itself. The former Royal Palace, a mixture of French and Lao architecture, is now a museum preserving the possessions of the monarchy and has one of the most golden and glitzy interiors around. Above the entrance is a three-headed elephant sheltered by the sacred white parasol, the symbol of the Lao monarchy. The most impressive room is the Throne Hall, a dazzling interior of mosaics and mirrors, with displays of royal regalia including glittering swords and the former King's own elephant saddle. The museum's most prized possession, the Pha Bang, a golden image of the Buddha, is housed in a small barred room that was the King's personal shrine. It is the most sacred image in the country, believed to have been crafted in the heavens, and containing miraculous powers of protection over the country. The museum has information in Lao and English but it is worth visiting with a local guide to really bring the place to life and hear all about the myths and legends as well as the history. Shoes and bags must be left at the entrance (there are lockers) and, despite the many images which have made their way onto tourist review sites, photography is not allowed. The most enchanting monastery in the country, and probably its most talked-about tourist attraction, is the magnificent Golden City Temple at the tip of Laos' peninsula. The graceful, sweeping tiled roof of the main temple is its most impressive feature and the walls are decorated with stencilled gold designs depicting many different traditional tales. At the rear, there is a splendid coloured glass mosaic illustrating the 'tree of life'. In the peaceful atmosphere of the compound garden are several shelters, housing rare Buddha images and the gilded royal funerary carriage. It is possible to visit too many temples in Laos and get tired of them as a result, as many of them are very similar. It is best to visit only a few and only the best. General consensus is that if one only explores one temple in Laos it should be Wat Xieng Thong. Bring a guide book or hire a local guide in order to appreciate the temple and its history fully. In the evening, the light reflects beautifully off the glass and gold of the walls and the monks are called in to prayer by drums. The mysterious Plain of Jars in the Xiang Khouang province is an unusual sight, and a must-visit tourist attraction for travellers to Luang Prabang. Hundreds of huge solid stone jars lie scattered about the landscape, some weighing up to six tonnes and measuring about six feet (2m) in length. They are believed to be over 2,000 years old, although their origin and function is unknown. Numerous theories and legends have been fashioned - one such legend states that they were made to ferment rice wine to celebrate a victorious battle against a wicked chieftain in the 6th Century; while other theories claim they were used as sarcophagi, or funerary urns. They are divided into five major groups, with Thong Hai, or Site 1, the largest and most easily accessible site. The jars lie amid thousands of unexploded mines left behind by the war, and as a result only Sites 1, 2 and 3 are open to visitors; the rest are considered too dangerous, and visitors should heed warning signs and keep to well-worn paths. Many guesthouses in the town of Phonsavan offer tours to the sites. While you're in Phonsavan be sure to visit the Mines Advisory Group (MAG) to learn about the clearing of unexploded bombs in the area and throughout Laos. The site is situated several kilometres southeast of Phonsavan, a 30-minute flight from Luang Prabang. Those interested in visiting can either hire a 4X4 or a small tuk-tuk for the day, with a driver/guide; or, for the adventurous, it is possible to hire a motorbike and drive out to the sites. Sites 1 and 2 are well signposted and the third one is easy to find if paying attention. The drive out to the sites is scenic and the people living along the road are generally friendly and helpful. About two hours by boat from Luang Prabang lie the Pak Ou Caves, which are only accessible from the water. This attraction has visitors rather divided: some find it an intriguing place of spiritual power and others don't understand what the fuss is about. Most agree, however, that the scenic boat trip to reach the caves is fun and worthwhile. Lower and upper caves contain an impressive collection of mostly wooden Buddha statues assembled over the centuries by locals and pilgrims. Each year, hundreds of pilgrims come to these caves to add a statue to the growing collection. The assortment of Buddhas - some in hard to reach places - is very interesting and there are some quite unusual specimens on display; anyone interested in religious icons will find the place fascinating. The upper cave (Tham Theung) is reached by means of a flight of stairs and requires the use of a flashlight, while the lower cave (Tham Thing) is visible from the river. If visitors want to explore the more mysterious upper cave then they should be sure to bring their own torch, or money to buy one at the entrance. Photos are permitted and candles can be lit as a tribute. The trip to the caves is often combined with visits to villages on the river banks or activities like elephant riding. 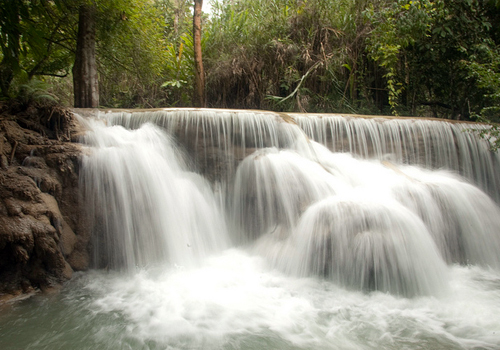 Frequently the top-rated attraction in Luang Prabang according to tourists, the beautiful multi-tiered Kuang Si Falls are worth a trip for their refreshing beauty and serenity. Turquoise-green water tumbles over a series of limestone terraces and collects in lovely pools that are surrounded by lush greenery. Walkways lead around the base and to the summit, about 200 feet (61m) up, and there are numerous places to picnic. There are also things like rope swings, branches and rocks to jump off and the swimming is glorious so be sure to bring your swimwear. It is best to get to the falls as early as possible before the crowds arrive to really appreciate the natural splendour and get good photographs. The falls are about 18 miles (29km) south of Luang Prabang. The famous 4,000 Islands region of Laos unfolds at the tail of the Mekong River in the far south of the country, lapping over into Cambodia. The area is renowned for its spectacular waterfalls, tranquil village life and unspoiled natural beauty. It is also home to the rare and only occasionally sighted pink Irrawaddy dolphin. The two most popular islands are Don Khong, the largest and most developed, and backpacker-magnet Don Det. Prices for accommodation and food are some of the cheapest in Asia. The area is also used as an entrance point to Cambodia, and buses frequently make the one-hour journey to the border. Don Det has become a bit grubby of late, although some people still rave about it. Don Khong seldom gets a bad review. This is the place to spend slow days hiking, biking, kayaking, swimming and relaxing in bungalows with balconies over the water. There is lots to see and do, including heading out for water safaris to look for the dolphins - be sure to ask the guides not to go too far, or else be prepared to pay a border crossing fee, as Cambodia is literally a stone's throw away. Si Phan Don is an unmissable place to visit in Laos for young travellers, or those travelling on a tight budget. 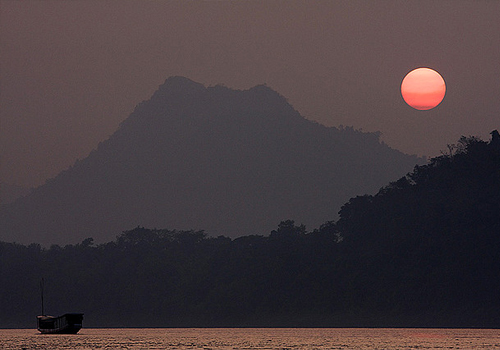 Phou Si is a hill near the confluence of the Mekong and Khan rivers, filled with temples. It is visible all over town and as such acts as a navigation landmark for visitors. The views of Luang Prabhang from the top of the hill are worth the steep walk of 355 individual steps. The lower slopes of the hill are dotted with the city's oldest temples, but the best is the golden stupa of That Chomsi at the top, built in 1804. Visit this wonderful attraction in the early morning, when it is cool and the temples are at their most active, or in the evening for the epic sunsets. Note, however, that sunset is the most popular time to climb the hill and during the peak tourism season it gets very crowded. Those wanting to experience the beauty and serenity of the place without the crowds should visit in the early morning. The climb is a bit easier from the back of the hill, where a trail winds gradually upwards and there are only about a hundred steps to master, as opposed to 300-odd! Some of the most interesting Buddha statues can be found via this back entrance. It's ideal to climb up one way and down the other so that all the views and sights can be appreciated. There is a night market in the road in front of the Old Palace, at the foot of Phou Si, which is worth strolling around if visiting in the evening. Modelled to mirror the Arc de Triomphe in Paris, Laos' Victory Gate is definitely a sight to behold. Although it is said to be a replica of Paris' Arc de Triomphe, the Laotians decided to one-up their colonial masters by building theirs slightly higher and with four gates (instead of the two that the European version has). Patuxai also has a number of decorative Buddhist ornamentations added to the original design. Apparently the structure was never quite completed and the locals like to joke about the fact that it was supposedly built from cement donated by the US and intended for an airport - which makes the 'victory' a little less defiant but perhaps more snide. To the casual observer it seems perfectly finished. The monument is open to those wishing to brave the heat and climb the seven flights of stairs, which, once surmounted, offer great views of downtown Vientiane. There are souvenir shops in between flights of steps but these are quite expensive. In the same area visitors can see the World Peace Gong presented to Laos by Indonesia, as well as a musical fountain. The landmark has become a gathering point for locals and some great photos can be taken of the structure. The COPE Visitors Centre can be a sobering reality-check for many visitors to Laos, but nonetheless is definitely worth a visit. Statistically, Laos is the most bombed country in the world, as a result of the US policy of letting planes offload their unused ordnance onto Laos during the Vietnam War (it was deemed unsafe for them to land with a cargo of unused bombs so they simply dropped them on Laos). This is an embarrassing and tragic aspect of the Vietnam War which many are totally unaware of. Laos has a significant amount of UXOs, or unexploded ordnance, particularly in rural areas along the border with Vietnam. Many residents of Laos have been victims of UXOs and the COPE Visitors Centre does vital work in educating the public and tourists and providing help for those who have lost limbs or loved ones to bombs. The Visitors Centre includes a gift shop and a selection of short films on Laos and UXOs. You may have to request to see the films but the staff are helpful and knowledgeable and will gladly assist you. The centre is not far out of town and many visitors like to hire bikes and cycle out to it. You will only need an hour or so to explore the place but it exposes tourists to a vital aspect of life in Laos and shouldn't be missed. Moreover, if you are planning to travel off the beaten track in Laos, knowing how to recognise and react to UXOs is important. One of Laos' most popular activities for tourists in recent years is a trip to the wonderful Houey Hong Vocational Training Center for Women. The centre's mission is to provide education and training to Lao women from disadvantaged backgrounds, to help assimilate them into the contemporary economy by teaching them the skills of natural dyeing, traditional Lao weaving, tailoring and small business administration. The centre is thus an important contributor to the Laos government's initiative of sustainable development in the local craft and tourism sectors of the economy. Visitors to the Houey Hong Centre are not just casual observers: rather, they partake in half- or full-day courses of their choice, in which they too are taught skills ranging from tie-dyeing silks to traditional Lao weaving using a loom. The Houey Hong Centre is a short tuk-tuk ride from downtown Vientiane and provides tourists to Laos with an unforgettable experience of traditional textile manufacturing, not to mention the chance to contribute sustainably to the upliftment of the local population. The best part? You get to keep whatever you make during your time at the centre to show off to your friends back home. These crafts make the most appealing souvenirs. One of Vientiane's oldest and most grandiose temples, Ho Phra Kaew has an extremely interesting history that sheds light on Laos' past relations with Thailand. The temple was built in 1565 by King Setthathirat for the express purpose of housing the Emerald Buddha, which he had pilfered from Chiang Mai in Thailand. The statue, made of green jadeite enrobed in gold, was then recaptured by the Siamese army in 1778 and returned to Bangkok (where it remains to this day). Even without the Emerald Buddha, Ho Phra Kaew - which was restored in 1936 and declared a national monument - is a wonderful tourist attraction, offering visitors to Vientiane a great opportunity to get to grips with Laos' varied cultural heritage. Among the items on display in the museum is a heavily-lacquered 16th-century door carved with Hindu images, and a collection of stone-cut figures representing Khmer deities. Note that although the temple houses some interesting artefacts the labels explaining their origins are only in French and Lao so it is worth doing some research beforehand if you don't speak these languages. The temple is near the town centre and has a lovely garden. Photographs are permitted. There is a small entry fee. Sometimes while travelling it's nice to take a break from visiting the usual tourist attractions and to experience the country as the locals do. Vientiane's Talat Sao (Morning Market) offers visitors the chance to do just this, with a bustling market-place that, despite its name, is open from 7am to 6pm every day. A wonderful place to do most of your holiday shopping in Laos, the Morning Market is housed over four floors in two Lao-style buildings, whose construction was largely paid for by the market vendors themselves. Although the market mainly caters to the local population (one can buy electric rice cookers and have shoes re-soled here), there are still plenty of authentic Lao products for tourists to snap up for a bargain. Be on the lookout for hand-woven fabrics, silver jewellery and local handicrafts. Bargaining is expected and generally very good-natured so be sure to smile, but don't be shy to beat down a price. There are also food stalls located right outside the buildings, allowing visitors to refuel between shopping expeditions. For those familiar with the sprawling markets of places like Thailand and Malaysia, this one may seem small and unimpressive, but for the uninitiated it is exciting. Those planning to travel to Laos should seek medical advice about vaccinations and endemic diseases at least three weeks prior to departure. Malaria exists throughout the country except in Vientiane, and typhoid and cholera occur in some areas. A typhoid vaccine is recommended for all travellers, except short-term travellers who will restrict their meals to major restaurants and hotels. Other risks include hepatitis E, plague, dengue fever, and Schistosomiasis if swimming in the Mekong River. Travellers' diarrhoea is a problem for many visitors; only drink bottled water and avoid dairy products, uncooked meat and fish, salads and unpeeled fruit. Medical care in Vientiane is extremely basic and outside the capital there are no reliable facilities to deal with medical emergencies. Medical evacuation is difficult to organise and very expensive. Travellers are advised to take out comprehensive medical insurance, and those who have an unstable medical condition should consider avoiding Laos. A yellow fever certificate is required by all entering from an infected area. Tipping is becoming more widely practiced in tourist hotels and restaurants, where 10 percent is expected; elsewhere, there is no need to tip. Many of the more up-market restaurants tend to include a 10 to 15 percent service charge in their bill.